Last night the inevitable happened. Australian products took out the top prizes at the Australian Cider Awards. The Hills Cider Co. took out the top perry prize and the “Best in Show” with their Pear. Congratulations to the team at Hills for a fabulous product. Scoring 57 points out of a possible 60 reflects the quality. And to cap the Australian night, the winner of the top cider was Small Acres Cyder with their methode champenoise ‘Cat’s Pyjamas’. Sponsored by Breowan Systems Ltd. Note to Medal Winners: If any producer would like to print medal stickers for use on bottles, or use a medal image on media or websites then please liaise direct with the Design Company – VAADA – for all templates. The authorised Cider Australia template must be used, there are no exceptions. Rhea from VAADA can be contacted on 02 6360 4339, or by emailing rhea@vaada.com.au Vaada can supply the template in soft form or they can arrange printing and supply on your behalf should you wish. Please liaise direct with Vaada for quotes, payment, etc should you wish to use their service. Judging for this years Awards was completed yesterday. Our thanks to the judges for their work in appraising the entries and to the volunteer committee for their work leading up to the Awards and on the two days. The header above shows yesterdays set-up for judging the “Best in Show”. All Awards were announced at the Presentation Dinner at the Sebel – Surry Hills (Sydney) on Friday 18th October. We are pleased to advise that Gary Awdey joins the 2013 Australian Cider Awards as our guest judge. Gary Awdey is president of the US Great Lakes Cider & Perry Association. He was also a member of the working group that wrote the BJCP cider style guidelines now used in the majority of American competitions. Gary has been judging cider in international competitions since 2004. His ciders have taken several notable awards in international competitions in the US, England and Australia . Gary has presented sensory evaluation workshops across much of the US. A cidermaker with a keen interest in both traditional and modern techniques, Gary worked with cidermakers across the US, Canada, England, Wales, Australia, and New Zealand from 2004 to 2006 in collaborative trials of enzyme-assisted keeving. He has recently relocated to the state of Indiana and is establishing an orchard of traditional European and historic American cider apples and perry pears and plans to establish an estate cidery. Max Allen and Neal Cameron will again be a part of the judging panel. Max Allen. Max is an award-winning wine writer, wine and cider judge and backyard cider maker. Wine columnist for The Weekend Australian and wine editor for Australian Gourmet Traveller magazine, he has been judging at Australian wine shows since 1995, most recently as Chief Judge at both the Alternative Varieties Wine Show and the Organic Wine Show, and has been judging cider for magazines and competitions since 2007. He is the editor of the recently published Australian Cider Guide and is researching a book about cider in Australia. Neal Cameron. Neal is the Head Brewer and Cider Maker for The Australian Brewery in Sydney. He is a regular contributor to magazines and books on all matters beer & cider as well as running his own consultancy. A regular beer & cider judge around the country, Neal has just been appointed Chief Judge at the Royal Sydney Beer & Cider competition. Note 1. The Presentation Dinner being held in association with the Cider Awards 2013 will again take place at the Sebel in Surry Hills (Sydney). Please see the note lower down on this page under “Awards Presentation Dinner” regarding those ciders and perrys that receive “best in class” or medals and the need to have product available for this Dinner. Note 2. The subject of styles and classes continues to be the subject of much discussion in the industry and within shows. Last year there were two question relating to products on the entry form, this year there are three. In consultation with the Australian Cider Awards judges it has been decided to ask entrants to not only decide the class into which their products are entered but also to describe the products as “old world style” or “new world style”. This is being done in an attempt to simplify the judges’ task by allowing them to judge like-with-like . If you have no particular preference then leave this question on the entry form blank. This years guest judge from the United States, Gary Awdey, is experienced with the same mix of styles as we have in Australia. It is hoped that by grouping the two types of product – rather than doubling the number of classes – it will be possible to better assist judges and potentially lead to more structured classes. 1. Where water is used in the production processes of a cider or perry (eg to reconstitute concentrate, or to adjust alcohol percentage) such products are to be entered in classes 9 – 14. 2. The use of sugar where its sole function is to promote the secondary fermentation process for products entered into classes 4 and 8 is acceptable. Where sugar or sugar substitutes are used in the production processes specifically to increase alcohol percentage or to adjust sweetness such products are to be entered in classes 9 – 14. 3. Entrants must declare the product as either Cider or Perry and enter it in one of the classes 1 – 14. 4. There is no flavoured Cider or Perry class. 5. Entrants must have a minimum of 225 litres of each product in stock at time of entry (25 dozen 750mL bottles or equivalent volume). 6. All entries must be available for sale in Australia at the time of entry. 7. The organising committee reserves the right to audit compliance in regard to entries. 8. An entry form and an entry fee must accompany each entry. Entries not accompanied by the fee and entry form will not be accepted. Entry charges for 2013 remain at $45 for members of Cider Australia and $55 for non-members. 9. Each entry will consist of 4 x 750mL bottles, or 8 x 375mL bottles or equivalent volume. Please note any remaining bottles may be used at the Awards Presentation Dinner. 10. More than one entry per class per entrant is permitted. Similarly, a product may be entered into more than one class eg a bottle fermented product eligible for Class 4 could also be entered into another of the cider classes as well. 11. Entries must be in a glass bottle. All closures permitted. 12. Entries must have a label on the bottle identifying the class number and producer. No show labels will be provided. 13. All entry forms and fees must be received by the organisers by Tuesday, 24th September 2013. No late forms or fees will be accepted. 14. Ciders and/or Perrys to be entered into the show must be delivered to 681 Huntley Road, Orange NSW 2800 by Tuesday 1st October 2013. 15. The judges’ decision is final. 16. The judges reserve the right not to award medals, prizes or certificates in each class. 17. Results will be published in the 2013 Australian Cider Awards booklet. Results will also be posted on the Cideroz website and the Cider Australia website. 18. Judges’ comments will be sent to the individual entrants. 19. Cider or Perry entered by an entrant into one class may be moved by the judges into another class at the judges’ discretion. Gold equals 55.5 – 60. Where Ciders or Perrys do not meet these criteria the notation ‘Best in Class’ may be indicated. 1. Dry Cider – specific gravity up to 1005. 2. Medium Cider – specific gravity between 1005 and 1012. 3. Sweet Cider – specific gravity 1012 and above. 4. Bottle Conditioned / Methode Champenoise Cider. 5. Dry Perry – specific gravity up to 1005. 6. Medium Perry – specific gravity between 1005 and 1012. 7. Sweet Perry – specific gravity 1012 and above. 8. Bottle Conditioned / Methode Champenoise Perry. 9. Dry Cider made using water and/or sugar in the production process. 10. Medium Cider made using water and/or sugar in the production process. 11. Sweet Cider made using water and/or sugar in the production process. 12. Dry Perry made using water and/or sugar in the production process. 13. Medium Perry made using water and/or sugar in the production process. 14. Sweet Perry made using water and/or sugar in the production process. The competition will be held at the Orange Agricultural Institute on Wednesday 9th and Thursday 10th October 2013. As in 2012 the presentation dinner for 2013 will be held at the Sebel, Surry Hills, Sydney on Friday 18th October 2013. Booking for the Awards Presentation Dinner: use the link below to download a pdf booking form and follow the instructions. September 24th – Deadline for Entry Forms for the Australian Cider Awards. October 1st – Deadline for entries to be delivered for the Australian Cider Awards. For information on the Australian Cider Festival at the Hotel Steyne use the link below. Friday 12th October 2012 at The Sebel, Surry Hills. Results were announced at the Presentation Dinner. Presentation of “Best in Show” Award for 2012. 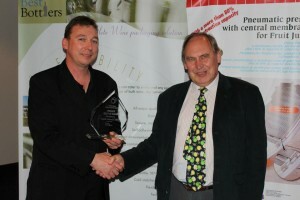 Wayne Breguet of Best Bottlers presents the trophy to Andrew Lea who accepted the Award on behalf of Henney’s Cider. The Presentation Dinner being held in association with the Cider Awards 2012 will take place at the Sebel in Surry Hills (Sydney). Please see the note lower down on this page under “4. Awards Presentation Dinner” regarding those ciders and perrys that receive “best in class” or medals and the need to have product available for this Dinner. 8. An entry form and an entry fee must accompany each entry. Entries not accompanied by the fee and entry form will not be accepted. 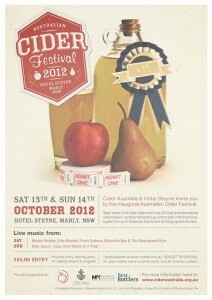 Entry charges for 2012 are $45 for members of Cider Australia and $55 for non-members. 9. Each entry will consist of 4 x 750mL bottles, or 8 x 375mL bottles or equivalent volume. Please note any remaining bottles may be used at the Awards Presentation Dinner. After that, any remaining bottles can be picked up at the end of the event by the entrant. 10. More than one entry per class per entrant is permitted. 13. All entry forms and fees must be received by the organisers by Tuesday, 2nd October 2012. No late forms or fees will be accepted. 14. Ciders and/or Perrys to be entered into the show must be delivered to the Orange Agricultural Institute by close of business on Friday 5th October 2012. Note: The Orange Agricultural Institute closes Saturday and Sunday and is open 08.00 – 16.00 Monday to Friday. No late deliveries accepted. 17. Results will be published in the 2012 Australian Cider Awards booklet. Results will also be posted on the Cideroz website and the Cider Australia website. The competition will be held at the Orange Agricultural Institute on Wednesday 10th and Thursday 11th October 2012. This year the Cider Awards Presentation Dinner will be held in Sydney with up to 200 people attending. This change has been made in association with the newly formed Cider Australia to make the Awards Presentation more accessible and to better publicise the award winning ciders and perrys. This provides a fantastic opportunity to get your product in front of the right people. The entries winning medals and/or best in class will be showcased at the Presentation Dinner through being matched by the judges to one of the courses served. We are asking that appropriate medal winners contribute 2 x cartons (9L or equivalent) to be served at the dinner. Additional carton/s will be purchased by Cider Australia from the producer to ensure we have sufficient stock for serving. Only the selected winners will be asked to supply extra stock for the dinner. We trust that you will agree with this move to publicise the top products in this way and will be prepared to provide this support to the dinner. The organising committee has taken a major step in regard to judging of the Australian Cider Awards 2012. Noted English cider expert Dr Andrew Lea who worked at the Long Ashton cider research station will be travelling to Australia and joining the judging panel for the 2012 Awards. 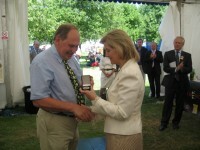 Andrew is photographed being presented with an NACM medal by the Duchess of Wessex in 2010. The presentation was made at the Royal Bath and West Show at Shepton Mallet. The citation quotes “A lifetime contribution to the cider industry”. Photo courtesy of NACM – see link below for full background to the medal presentation. Max Allen and Neal Cameron will again be a part of the judging panel and will again be joined by associate judge Lucy Maddox. Max Allen. Max is an award-winning wine writer and backyard cidermaker. Wine columnist for The Weekend Australian and wine editor for Australian Gourmet Traveller, his latest book is The History of Australian Wine: Stories from the Vineyard to the Cellar Door. He has been judging at Australian wine shows since 1995, most recently as Chief Judge at both the Alternative Varieties Wine Show in Mildura and the Organic Wine Show in Sydney, and has been judging cider for magazines and competitions since 2007. He is researching a book about cider in Australia. Neal Cameron. The architect of William Bull Brewing and Angus Red Pilsner, Neal Cameron is also an accomplished contract brewer, crafting beers for some of the best known boutique beers in Australia. Neal has recently moved to Sydney to start The Australian Brewery in Sydney’s northwest which has already produced medal winning beers under his tutelage. Neal is a regular judge at The Australian International Beer Awards, he writes for Beer & Brewer magazine (specialist subject cider) and is on the executive committee of the NSW Brewers Guild. Judging of the Australian Cider Awards 2011 took place on Thursday 15th September at the Orange Agricultural Institute. Results were announced that night during the Awards dinner to an enthusiastic gathering at the Old Convent, Borenore. Henney’s Dry Cider was placed first in Class 1 – Dry Cider SG up to 1005 – and was adjudged the Best in Show. Napoleone & Co Pear Cider Traditionelle (Class 8). Max’s article also has a video clip reviewing some of the ciders.